I am always looking for easy dinners when Bryan is traveling- so we don’t eat Chick-Fil-A every night! 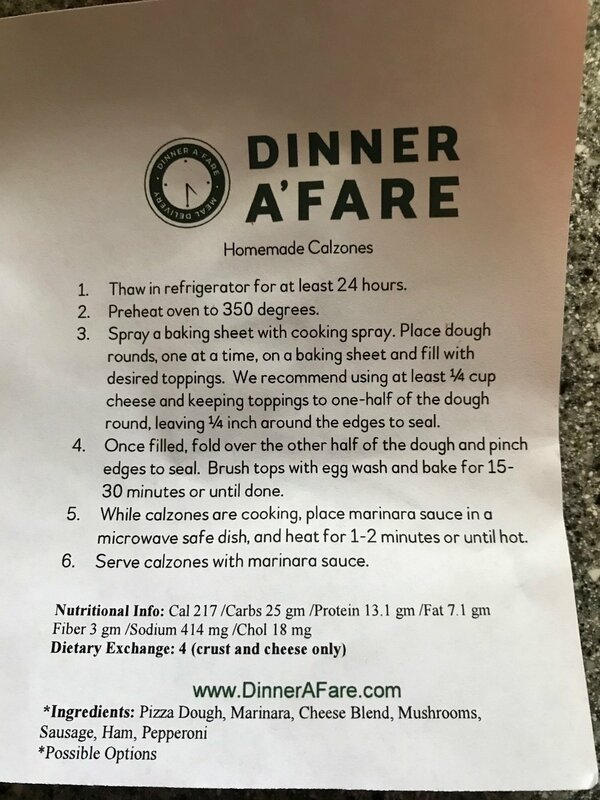 One of my favorite bloggers shared several times about A Dinner A’fare and how easy and delicious their meals are, so I knew I wanted to try them. One week, when Bryan was out of town for a full week, I decided to try it out. I was so excited to have to not grocery shop, prep or think about what I would be making for dinner. I ordered and waited for it to arrive. It arrived frozen and in a cooler. The meals came wrapped in brown paper bags with labels on the outside so I knew which meal was which. I popped them all in the freezer. Each morning, I took out the meal I wanted that evening. It would thaw throughout the day, and be ready at dinner time. Everything was prepped and ready to go. The meals were super simple to make- most of them went right into the oven. I would toss a salad and be ready to sit down to a delicious meal. If you want to try A Dinner A'fare, you can get $25 off a $99 order with the code: REFDICZUS4XHL . You can also email me and I can send you a code. If you try it out, I would love to know what you think! *This post is not sponsored by A Dinner A'fare. I just purchased meals and loved them, so I wanted to share!